Though it is a common term to us, we understand that "Environmental Graphics" can be a somewhat unclear concept. Despite how it may sound, Environmental Graphics does not necessarily relate to "green" design. Environmental Graphics describe visual elements within a facility or campus that serve to enhance the overall appearance of their environment. While these elements can often be communicative and assist in wayfinding, Environmental Graphics can also be purely aesthetic. 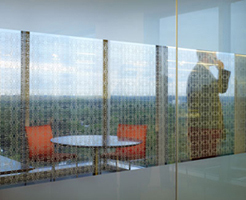 Common examples of Environmental Graphics include large-scale digitally printed wall graphics, decorative window vinyl, and themed environments or exhibits.